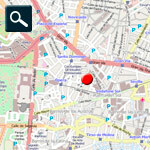 Amidst the bustle of the centre of Madrid there exists a pocket of the past; a remnant of the old Habsburg dynasty. An enclosed monastery, sober-looking and modest from the outside, but which houses extraordinary artistic wealth within its beautiful interior, which is set up now as a museum. The monastery of Our Lady of the Visitation, or of the Descalzas Reales (Barefoot Royals), is a convent of enclosed nuns of the Order of Saint Clare, and was founded in 1559 by Joanna of Austria, the sister of King Philip II of Spain, widow of Prince Juan Manuel of Portugal and mother of the future king of Portugal, Sebastian. Its founder was buried here upon her death. 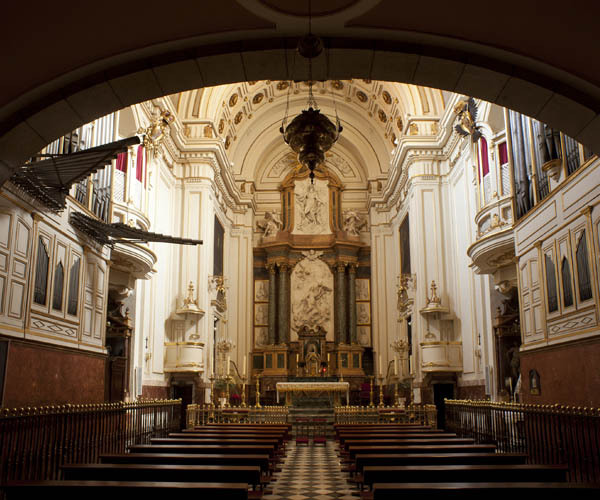 Located in the centre of Habsburg Madrid, the convent is a Renaissance complex made up of a church and the nuns’ living quarters, and is notable for its sober Classicism. It possesses a rich historical and cultural legacy: for example, its music chapel was one of the kingdom’s most important, with composers including the great Tomás Luis de Victoria directing and working in it. But it also holds great works of art, which are on display today as a museum open to the public. The monastery of the Descalzas Reales was originally a palace constructed at the request of Emperor Charles V; it was here in 1535 that its future founder, the infanta Juana, was born. At the end of the 1550s, the master builder Antonio Sillero adapted the building to house the nuns of the Order of Saint Clare in the monastery newly-founded by Joanna of Austria. The facade, which is in the Toledan Renaissance style, was constructed by Sillero himself in 1559; the church, in an annexe, and its facade are the work of Juan Bautista de Toledo, and date from around 1561. The church was reformed in 1756 by Diego de Villanueva. The church’s facade is archetypal of the style of Juan Bautista de Toledo: built in granite, sober, free of any ornamentation, stark geometry (combinations of squares and rectangles), and a classical clarity which had scarcely been imagined by any of the architect’s contemporaries. Inside, the steps of the altar, sacristy and choir are the work of Juan Gómez de Mora (1612), and the Great Retable – now lost – was produced by Gaspar Becerra in 1565. 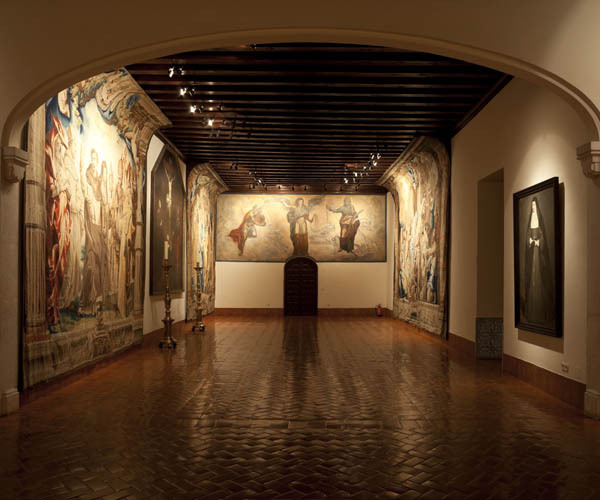 However, the importance of the Descalzas Reales stems not so much from the building itself as from the works of art within, both within the walls of the convent and the museum. 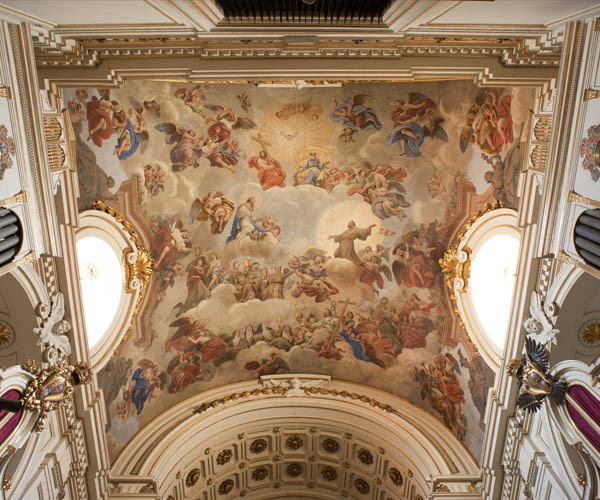 For example, there is remarkable fresco work by artists including Claudio Coello, Francisco Rizi, Antonio de Pereda and Luca Giordano. Its sculpture collection is similarly valuable, with works by Gregorio Fernández, Juan de Mena, Gaspar Becerra and Pompeo Leoni, who created the marble mausoleum where the founder, Joanna of Austria, is buried. Becerra also sculpted, along with the lost Great Retable, a Christ recumbent of marked drama and with a monumental aspect. This statue is a processional image which is still used today during Madrid’s Holy Week processions, which centre on the monastery. In terms of painting, the Flemish, Italian and Spanish schools are all represented. Some of the most important works include those by: Alonso Sánchez Coello (Prince Diego and Prince Philip, Prince Ferdinand); Juan Pantoja de la Cruz (Princess Anna of Austria); Eugenio Orozco (The Adoration of the Magi); Claudio Coello (Charles II); Antonio (The Immaculate Conception) and Sebastián de Herrera Barnuevo (a retable of Our Lady of Guadalupe); Antonio (a portrait of Sister Margaret of the Cross) and Francisco Rizi; Titian; Juan Carreño de Miranda (The Coronation of the Virgin); Brueghel the Elder; Francisco de Zurbarán and Bartolomé Esteban Murillo. The collection of sacred art is also noteworthy, and includes ivorywork and crucifixes from the German, Spanish and Philippine schools dating from the sixteenth and seventeenth centuries. But perhaps above all, mention must be made of the tapestry series, including one based on cartoons by Peter Paul Rubens. This magnificent series of twenty tapestries is about The Triumph of the Eucharist and was weaved between 1625 and 1626 in Brussels in the workshop of J. Raes and Geubels. Geubels’ models, in oil, are kept in the Museo Nacional del Prado. Rubens was commissioned by Princess Isabella Clara Eugenia, daughter of Philip II, who was to spend the final years of her life in the convent. This work, which Rubens himself cherished amongst his oeuvre, was one of his most signifant projects carried out at the end of the 1620s. He manifests the whole scope of his rhetorical and sensationalist capacities, putting it to use in a triumphant and proud Catholic sentiment. The profusion of symbols, allegories and references to Antiquity in these works are an exemplary show of the cultural mingling of the Christian and Classical worlds, which was particularly popular in European courts at the time. Rubens successfully depicted these worlds together like no other painter from the period. 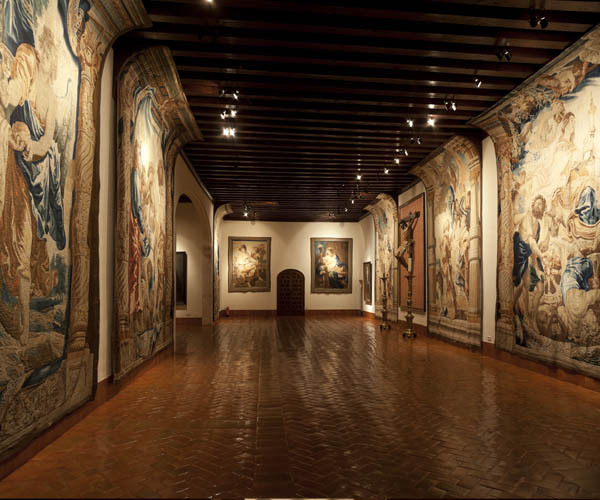 The tapestries arrived in Spain not long after Rubens himself made his second journey to the country in September 1628.